Crown molding is a bit tricky but not impossible. You should practice making corner cuts. A compound mitre saw makes cutting easier but a coping saw can do the job. A simple and inexpensive wood mitre box and a stud finder is helpful. 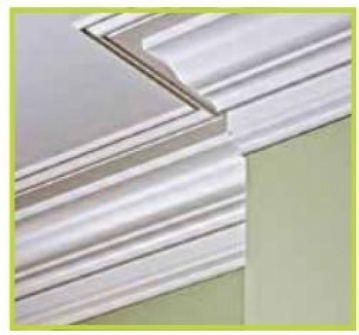 An assistant is a big help by holding up the crown trim while you measure, cut and nail. 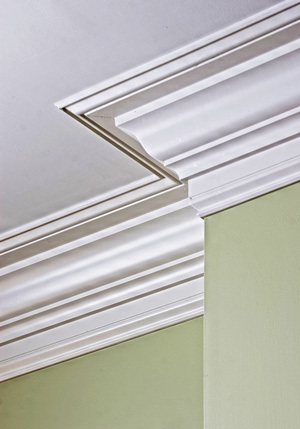 Molding prices vary depending on the size and complexity of the design. It starts at about $3.50 per foot. At the high end you can spend $15 to $20 per foot. If your room is 11’ x 14’ – that’s 56 lineal feet including waste from 12’ and 16’ pieces. Your material cost is about $225 plus nails, paint or stain. Use scrap ends for practicing your cuts. A simple rectangular room like a dining room can be trimmed out in about 4 hours. Move everything away from the walls to have room to move your ladder around. Locate the studs using a stud finder or the thumping method. Another simple way is to drive a nail in where the hole will be hidden behind the molding. Using a small scrap piece of the molding, hold it where the studs are and make tiny pencil marks below the piece to mark the stud location. Erase them later. Start with a square cut in each corner. Now you make that first coping saw cut. Trace the profile of the molding of the next piece at an angle and cut out the back of the molding. Try the piece for fit. Practice this a couple times. You will get the knack of it quickly. Check your pieces for level before you do the final nailing. Set all the nails slightly and fill in the holes with wood putty. You may want to prime the pieces before you begin. That saves one step working on a ladder. Sand the joints and putty surfaces and paint or stain. If you have two step ladders and a plank, you can set up a working platform. A big caution – don’t step back and off the plank! !